This post kicks off Startup Summer Camp, a FREE program featuring a weekly lesson delivered via email, including homework that will help you become a lean, mean, lead generation machine! It's not too late to join in on the fun, sign up here. If you are doing a startup, chances are, it will fail. Now’s the part where I tell you that I’m an eternal optimist. But, my guess is that you are too, otherwise, why would you move forward, despite the fact that you have 90% chance of failure? The good news is that there are several things that you can do increase the chances that your startup will be part of the successful 10%. All of these come down to focus. The words focus and startups going hand in hand. You’d be hard pressed to find an expert that doesn’t preach the benefits of focus or the pitfalls of a lack. Focus is equally important to startup marketing as it is to running a startup in general. Marketing messages and initiatives resonate when they speak effectively to buyer needs. But, in order to focus marketing efforts, it is important to address a few key marketing questions. As basic as they may seem, these questions are important. You’d be surprised how many startup execs push forward without addressing these things. Ideally, you should have a very clear and succinct answer to each of these questions. In the early stages of this exercise, however, this exercise might spur more questions than clear answers. The important thing is to prioritize the process of defining these things. Does everyone remember the 5Ws (+1H)? Define the industry/person/job title and other characteristics of your target buyer. It’s not as obvious as it sounds, but it’s not a trick question, either. What specifically are you selling? When is your product a must-have for the buyer? Outline the scenario that exists when your buyer most needs your product. Where does your buyer spend time? This answer could include physical locations/geographic areas or online communities where your buyer interacts. What would happen if you didn’t exist? Why is your product/solution important? How does your buyer buy? What is the process that your target buyer undertakes in order to make decisions? How long does it take? Who else is involved? Answering the 5 Ws (=1H!) for your startup will help you focus your marketing efforts on the most important factors for success. 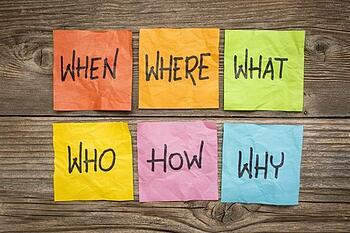 How have you answered these questions for your startup? Which question is the hardest to answer? Share your experience in the comments section below.